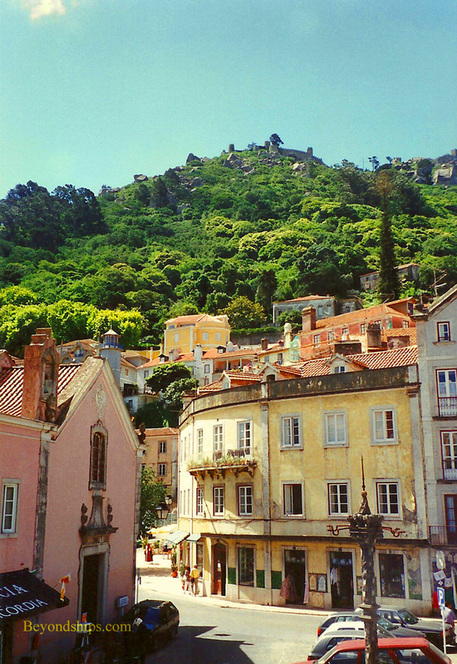 Right: The ruined Moorish Castle looks down upon the town of Sintra. 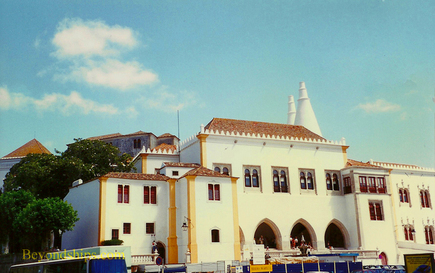 Above: The National Palace in Sintra. 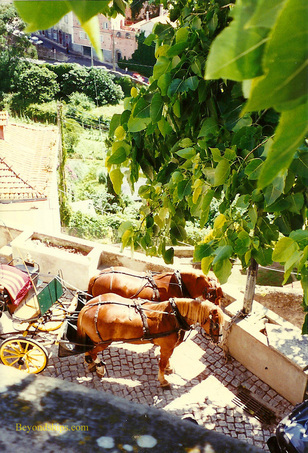 Below: A horse and carriage ride evokes the leisurely and elegant lifestyle of Sintra's past. 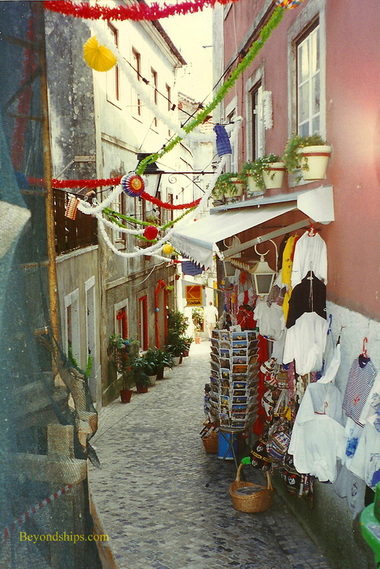 Above: Although touched by the modern world, Sintra's narrow streets still have the charm of bygone times. Above and below: The formal gardens of the Queluz National Palace. There is evidence of Neolithic settlements in the area as far back as the 5th Millennium B.C. Later, the Romans were attracted here as were the Moors who built a castle atop one of the peeks and which romantic ruin still overlooks the town. Located within easy reach of Lisbon (about 18 miles), Sintra is set on a towering promontory rising some 1,763 feet above sea level.. Inasmuch as it can be 20 degrees (Fahrenheit) cooler here than in the city, it is not surprising that the town became the summer home of the Portuguese royal family as well as other European aristocrats. Many of their palaces and mansions can still be visited today. The most frequently visited of these palaces is the National Palace . Built on the site of a Moorish palace, the oldest parts of the present palace date from the early 14th Century. Over the centuries it was expanded and re-decorated by several kings and queens so that it is now a unique blend of Gothic, Manueline and Moorish styles. The two conical towers that immediately draw the eye are actually the chimneys of the kitchen. Inside, visitors can explore a series of significant rooms housing an extensive collection of paintings and other decorative arts. While the palaces and mansions tend to dominate, the village itself has a romantic appeal. It too recalls an earlier time in its architecture and narrow streets. Of course, many of its shops, restaurants and cafes cater to the many visitors that follow each year in Lord Byron’s footsteps. 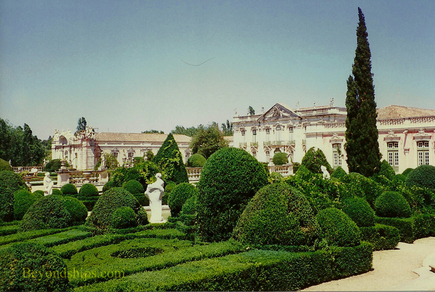 Also just outside of Lisbon is the Queluz National Palace. 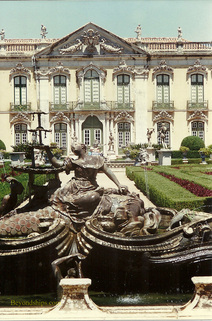 This royal residence has been called the “Portuguese Versailles” although it is much smaller than the French palace. It was begun in 1747 and was one of the last Rococo palaces built in Europe. Damaged by fire in 1934, the palace has been extensively restored. It now houses a large part of the former royal collection of paintings, carpets and other decorative arts. In addition, the palace is still used for state occasions including entertaining and housing visiting heads of state. (U.S. Presidents Eisenhower, Reagan and Clinton are amongst Queluz’s visitors). 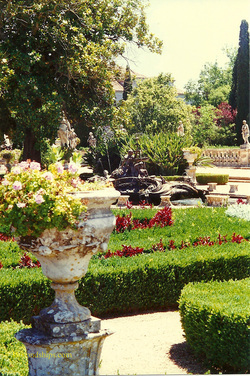 Surrounding the palace is an impressive formal garden with fountains, ponds, canals and statues.